The mysterious turn of events started in this particular place in West Bank, Cainta, Rizal on August 18, 2017. At around past 12 o’clock midnight, 19-year-old Carl Angelo Arnaiz was in his home tending to his sari-sari store by this window. Three of his neighbors were idly spending time here. Sari-sari store of Gelo, a former UP Diliman student. Gelo, as his family would call him, rarely left his home. According to his neighbors, one wouldn’t immediately sense that Gelo has a decorated academic background as an elementary valedictorian, Makati Science High School graduate and former Interior Design major at UP Diliman. He would just gently smile during the rare chance that people would see him out of his home. His neighbors also understood that he was going through a bout of depression. Some of them believe Gelo didn’t want his mother to continue working as an OFW in the Middle East. So it may have come as a surprise to his neighbors when they learned that during that fateful night, Gelo invited the three minors who were in his sari-sari store for a quick treat at a nearby mami house. Since Gelo will be picking up the tab, the three boys gladly joined him. The four of them rode a tricycle and had fun while filling their stomachs. But at around 1:00 am, the three minors all urged Gelo to head home because it was getting late. After just an hour, they all traveled back to West Bank. But according to his friends, Gelo wanted to go out still. They said he had about P7,000 that night. They also remember seeing a 14-year-old teenager in the vicinity of the sari-sari store when they returned from the mami house. It wasn’t clear why the boy was there. But it appeared he was about to buy something from Gelo’s sari-sari store which was still open. The boy’s name is Reynaldo de Guzman. The neighborhood knows him by a more familiar nickname—Kulot. A Grade 5 student with meager means, Kulot just happened to be there. He is a familiar face in their community because he used to sell fish with his mother and worked sideline repair projects with his father. Neighbors describe Kulot as a kind and helpful boy. His surname is De Guzman but it’s really Gabriel. When his birth certificate was registered, the surname of his grandmother was erroneously used and it hasn’t been corrected since. Kulot wasn’t a close friend of Gelo. Nonetheless, Gelo invited Kulot for his second food trip. Gelo’s earlier companions went to their respective homes already. Little did they know that it was the last time they would see Gelo and Kulot alive. Gelo and Kulot never went home after that supposed food trip. Gelo’s family had no idea where he went or why he left in the first place. He failed to inform his cousin and grandmother why he ventured that night. Maybe if it wasn’t for a tipster via Facebook, the Arnaiz family may have never learned of the fate of Gelo. 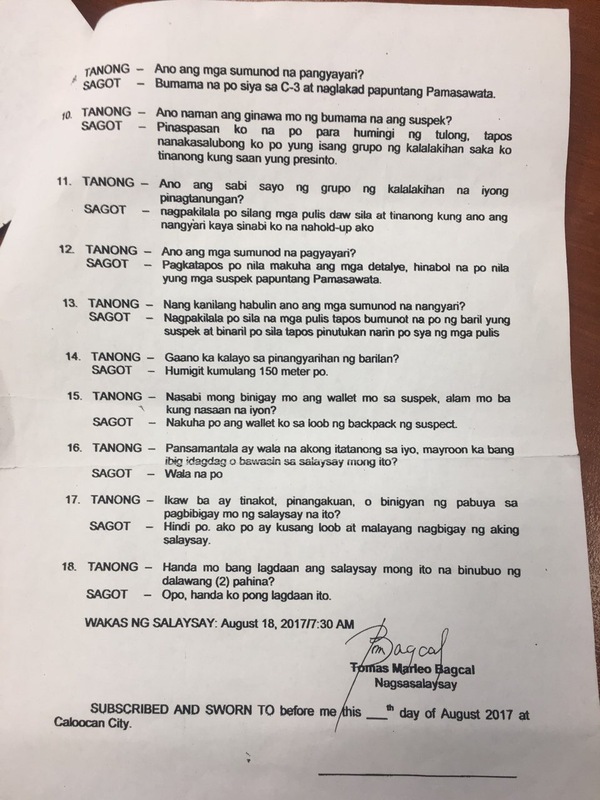 An employee of a funeral parlor in Caloocan messaged Gelo’s sister about an unidentified corpse in their morgue on August 28, 2017. The family visited the morgue immediately. They were devastated to find out that Gelo was already a cold corpse for more than a week. They have now been relieved and sent back to Camp Bagong Diwa. Page two of the first affidavit. 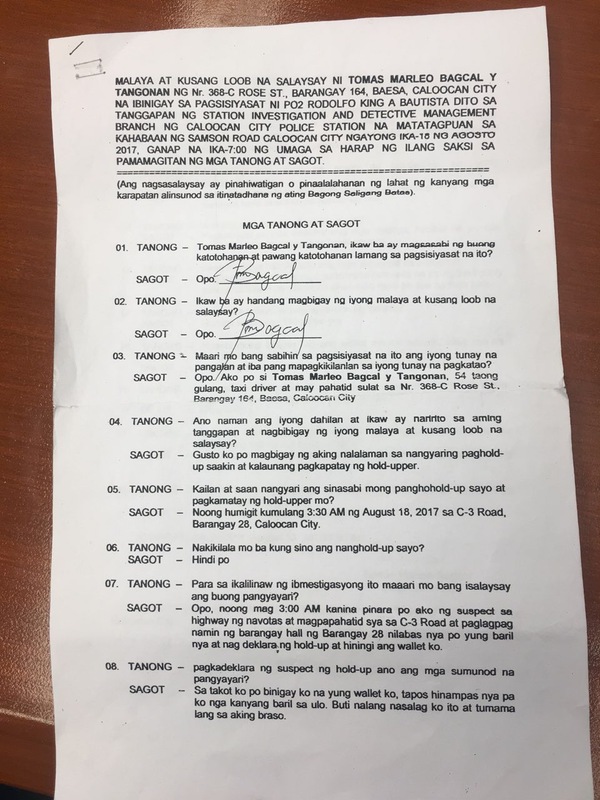 Taxi driver Tomas Bagcal has not been reporting to duty anymore according to news reports, following the national attention to the case of Carl Angelo Arnaiz. 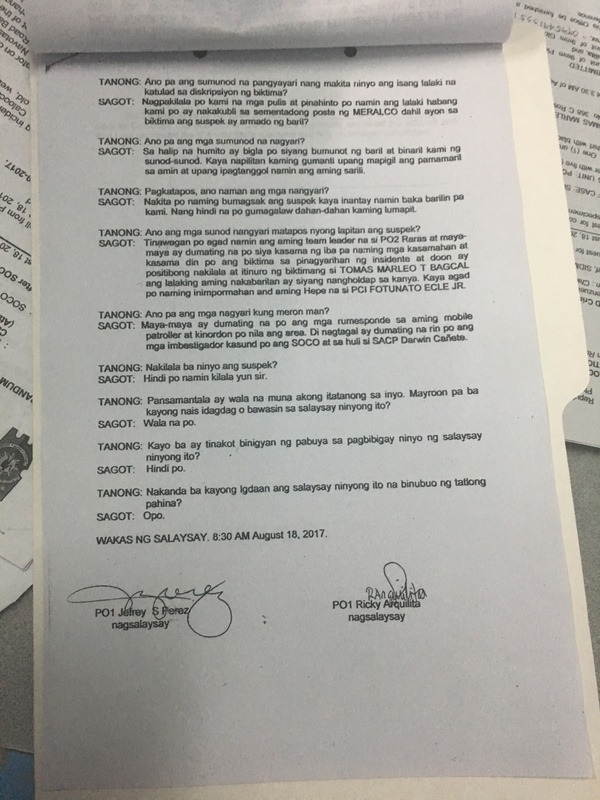 The second affidavit mentioned details that were more compatible with the spot report of the Caloocan police. The questions of the Arnaiz family surrounding his death didn’t die with Gelo. They were wondering why he ended up in Caloocan when he came from Cainta. The Arnaiz family also doubts the version of the Caloocan police. They said Gelo doesn’t know how to fire a gun and that he wasn’t even in any drug watchlist to begin with. His friends were also surprised because Gelo was wearing a red V-neck shirt and brown shorts when they went to the mami house. 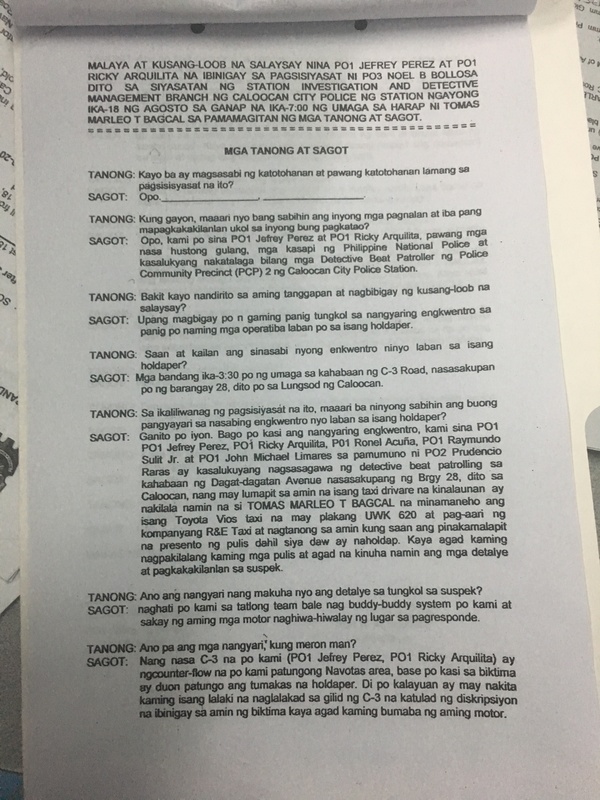 But the spot report describes Gelo as wearing a blue T-shirt with black hoodie, maong pants and a black cap. His new Lenovo smartphone was also missing. In its place was a KPad Android gadget without a sim card. The estimated P7,000 that Gelo supposedly had that night in his wallet was also not recovered, along with the pliers, screwdriver and hammer that his friends saw in his bag. His friends didn’t know what the tools were for but they said Gelo didn’t ask them to rob anyone. Suspicious of the story of the Caloocan police, the family sought help from the Public Attorney’s Office (PAO). 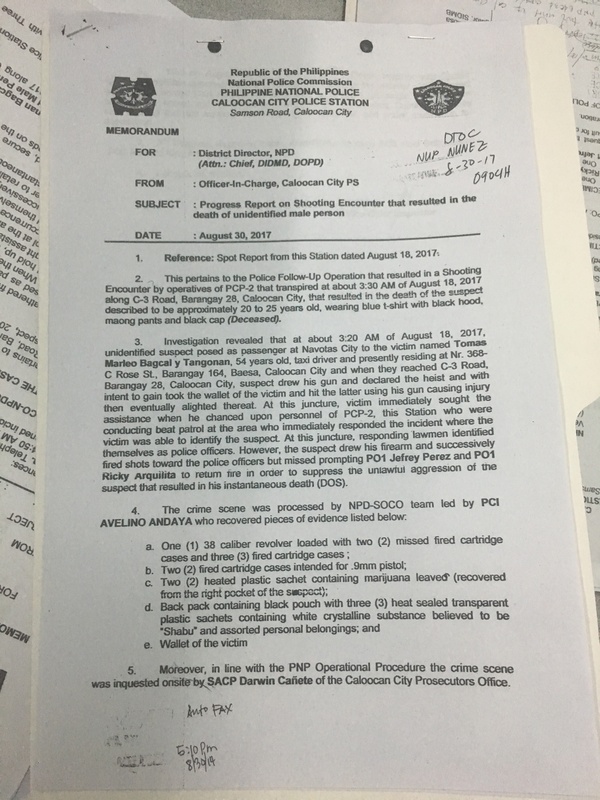 Forensic experts from PAO conducted a post-mortem examination on Gelo’s body and their findings are compelling to say the least. They concluded that Gelo suffered before he died. There were indications that he had swollen eyes from blunt force trauma, abrasion wounds in his limbs, handcuff marks in his wrists, and that he was possibly kneeling when he was fatally shot in the chest. Having been kept in the morgue for 10 days, Gelo’s wake didn’t last long and he was immediately buried. It has been a Filipino custom for families seeking for justice to put these animals at the casket of their departed loved one. The wake for Carl Angelo Arnaiz. He was buried last September 5, 2017. Kulot remained missing even though Gelo’s corpse has been found on August 28. After Gelo’s case gained the attention of mainstream media, Kulot’s mother, Lina Gabriel, took the opportunity to talk to news crews about his missing son. Eddie and Lina Gabriel. Kulot’s parents. If Gelo and Kulot left West Bank, Cainta together—as witnessed by Gelo’s three friends—then why was Gelo alone when he supposedly robbed a taxi? What happened to Kulot? Where did he end up? There were no clues. The search for Kulot was almost a dead end—until the search ended with a dead body in Gapan, Nueva Ecija last Tuesday, September 5. 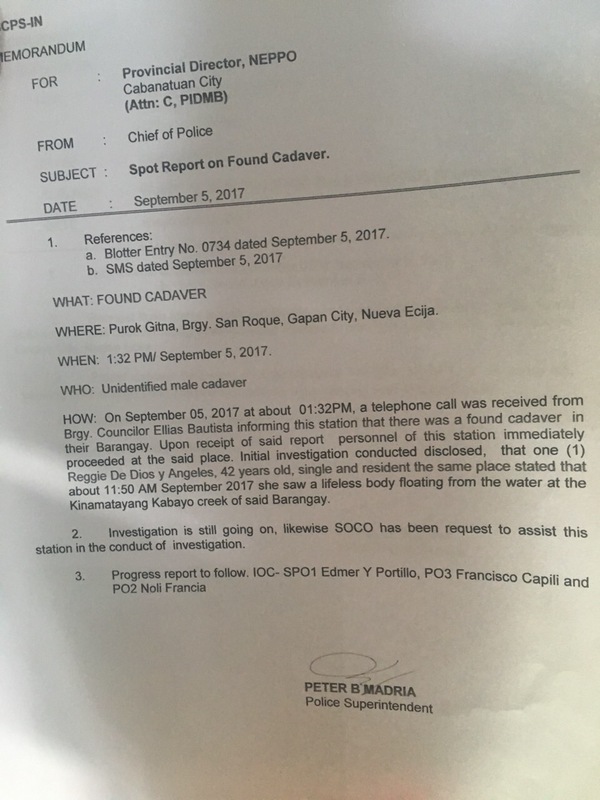 An unidentified male cadaver recovered in a creek in Gapan, Nueva Ecija. Photo courtesy: Saleema Refran, GMA News. The body was discovered on September 5, 2017—the same day when Carl Angelo was buried. Photo courtesy: Saleema Refran, GMA News. Kulot, 14, was stabbed to death. Our Public Affairs show Brigada has been working closely with our news teams to create a documentary on the case of Carl Angelo Arnaiz. The show’s news researcher, Abby Banaag, called to inform me that same morning about an unidentified cadaver in Gapan, Nueva Ecija that may be the missing Kulot. Aling Lina headed to Gapan along with the Brigada team, senior correspondent Saleema Refran of GMA News, and other news networks. That afternoon, Kulot’s mother identified the corpse as his son who has been missing for over three weeks already. A witness described hearing a loud noise at the back of his house at around 11pm of September 4. His family just ignored the sound, thinking it was merely someone throwing garbage. By daytime, the witness discovered that it was indeed a corpse, floating face down in a creek in Barangay Baluarte. At around 12 o’clock noon of September 5, the Gapan PNP arrived shortly to retrieve the corpse. They noted that the body sustained more than 30 stab wounds and had packing tape wrapped over his head. Veteran forensic pathologist Dr. Raquel Fortun observed from the retrieval pictures that the corpse has not really decomposed and that changes are more beacuse of immersion. Autopsy should be carefully done on the body before it undergoes embalming. Dr. Erwin Erfe of PAO remarks that it’s a recent death, with an estimate of 24 hours or less. This can be quite telling because Kulot has been gone for three weeks. If he has been killed recently, where was he all along? Unlike in the cases of Kian Delos Santos and Carl Angelo Arnaiz, PAO will not conduct an autopsy for Kulot. NBI-NCR will take over upon instructions from the Department of Justice. Dead men tell no tales—more so, dead teenagers. Gelo and Kulot are no longer here to tell us what transpired when they left Cainta. What really happened to them? At what point did Kulot part ways with Gelo? As the investigation continues, the hope of many is for justice to prevail. Or will it disappear and die as well? Reynaldo de Guzman, 14, was found dead on September 5, 2017. Photo courtesy: Abby Banaag, Brigada. Bam Alegre is the founder of SubSelfie.com and writes from time to time as a guest contributor. He is a News Reporter for GMA News (2012) and a Special Lecturer for the College of Arts and Sciences at the University of the East (2015). He was also part of the team that won GMA News the prestigious George Foster Peabody Award for the news coverage of super typhoon Yolanda (2013). Previously, he worked behind the scenes as a Segment Producer for State of the Nation with Jessica Soho and 24 Oras (2009-2012). He is also the vocalist and guitarist of the band No Parking (2005). BA Broadcast Communication 2007, UP Diliman. Read more of his articles here.